FastDomain offers a single shared hosting plan that rivals or exceeds its better-known competitors in the number of unlimited features provided. These include disk space, bandwidth, domains hosted, MySQL and PostgreSQL databases, e-mail accounts, and more. Other positives include, the cPanel control panel; 24×7 phone, chat, and e-mail support; a 99.99% uptime guarantee; a 30-day money-back guarantee; and an ‘A’ BBB rating. Unfortunately for FastDomain, one must also consider performance, an area in which they were found lacking. Further, we found their pricing disclosure policy to be unacceptable. On balance, FastDomain has earned the NCM Online designation of NOT RECOMMENDED. FastDomain offers a single, fully-featured shared web hosting plan. Introductory pricing options include $7.99 per month for a 1-year term, and $6.99 per month for 2-year and 3-year terms. Unlimited plan features include: disk space, bandwidth, domains hosted, subdomains, parked domains, MySQL databases, PostgreSQL databases, FTP accounts, e-mail accounts, e-mail forwarders, and e-mail auto responders. Plan highlights include: cPanel control panel, MOJO Marketplace applications installer, password-protected directories, custom Cronjobs, shell access (SSH), shared SSL certificate, custom error pages, log files, site stats, server side includes (SSI), Frontpage 2000/2002 extensions, courtesy site backups, streaming audio and video support, Real audio and video support, 3 webmail clients, Spam Assassin e-mail protection, and a free domain name (first-year only). The cPanel control panel. It does not provide the range of functionality or the ease of use of the cPanel or vDeck 4 control panels. Click to enlarge. The FastDomain MOJO Marketplace installer. Click to enlarge. FastDomain utilizes a quick and simple, 2-step checkout process. However, it is something less than consumer-friendly. Step 1 provides for the selection a new domain name or the entry of an existing domain name. We entered domain name in the existing domain form field and clicked the “NEXT” button. Step 2 provides for the entry of account information; the selection of a hosting plan and payment term; and the entry of billing details. We completed the account information, and selected the short available term: 12 months at $7.99 per month. We were displeased to see that “Site Backup Pro” at $1.99 per month, and “SiteLock Security” had been automatically added to the shopping cart. We unchecked both items. Payment options include PayPal, Visa, MasterCard, Discover, American Express, We selected the PayPal option, and completed the checkout process. Judging by the information provided on the FastDomain homepage, Hosting Features page, Terms of Service page, and User Agreement page; as well as the checkout process; one might be led to believe that hosting plans renew at the initial rate. The prices are not followed by asterisks, nor do these pages indicate that the prices presented are introductory prices. In fact, renewal rates are higher. After completing our purchase, we located renewal pricing on the ‘Renew’ page in ‘Account’ section of the control panel. The options presented included: 3-months at $11.99 per month, 6-months at $11.99 per month, 12-months at $9.99 per month, 24 months at $8.99 per month, and 36 months at $7.99 per month. We contacted FastDomain via the chat option to inquire where one might find the renewal prices on their website. We were informed that renewal prices were available on the ‘Price’ page located within the ‘Helpdesk’ section. This proved to be true, however, there is no direct link to the ‘Price’ page from the FastDomain homepage, ‘Hosting Features’ page, or the shopping cart. We consider such pricing disclosure policies to be deceptive. NCM Online has and will continue to point out any less-than-transparent business practices employed by the web hosting companies we review. Further, we have and will continue to deduct from the ease-of-use and satisfaction ratings of any host that utilizes such practices. FastDomain’s ratings have been adjusted accordingly. Within seconds of placing our order, we received the FastDomain “Welcome” e-mail. It included control panel and FTP login information, nameserver settings, links to various website functions, and support contact information. Using the information provided, we were able to quickly upload our test site (click for sample test site) via FTP. 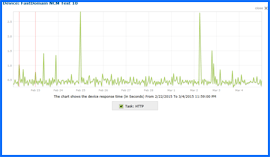 We then proceeded to set up Dotcom Monitor page-load speed and reliability testing. Aside from the shopping cart and renewal pricing issues, FastDomain web hosting is easy to use. Shared plans utilize the newbie-friendly cPanel control panel (screenshot above right), and the capable MOJO Marketplace applications installer (screenshot right). The cPanel control panel allows for easy access to a complete range of webmaster functions. The numerous interfaces are well-designed, and permit even novice webmaster to efficiently execute almost any task associated with website development and maintenance. cPanel is a hosting industry best-practice, and the most popular shared hosting control panel with good reason. While we prefer the Softaculous and Installatron applications installers, MOJO marketplace is utilized by a good number of popular hosts. Not quite as fast as Softaculous or Installatron, MOJO is effective, easy to use, and well equipped with numerous popular hosting applications. FastDomain’s MOJO Marketplace installer provides access to more than 75 apps including WordPress, Joomla, Drupal, b2evolution, concrete5, PHP-Nuke, Open Classifieds, Front Accounting, Sugar CRM, ShopSite, Zen Cart, Presta Shop, Magento, Moodle, LimeSurvey, SMF, phpBB, MyBB, Vanilla Forums, Lazarus, DadaMail, Piwigo, Coppermine, Gallery, Mantis, elgg, Pligg, Piwik, osTicket, X7Chat, phpMyFAQ, Roundcube, PmWiki, WikkaWiki, MediaWiki, and many others. FastDomain Web Hosting 10-day Uptime Test Results Chart. Click to enlarge. Speed and reliability testing began on 2/22/15 and concluded on 3/4/15. Utilizing our simple 1-page test site, FastDomain was subjected to a total of 1108 server reliability checks from 13 worldwide locations over the course of the 10-day test period. Unfortunately, 6 of those checks failed, reflecting brief, intermittent downtime periods on 2/22/15 between the hours of 06:28:14 AM and 11:41:15 PM. The problems were reported by our Virginia, Amsterdam, and Frankfurt test locations. All errors were of the DNS 12007 type — “The host name could not be resolved.” Overall, FastDomain compiled a disappointing 99.7139% uptime record for the 10-day test period (see Uptime Results Chart above right). FastDomain Web Hosting 10-day Speed Test Results Chart. Click to enlarge. 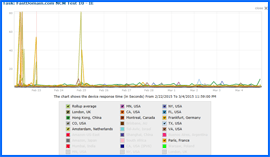 In addition to the problems of 2/22/15, our page-load speed testing reported DNS errors on 2/23, 2/24, and 2/25/15. These errors contributed to FastDomain’s poor page-load speed average. FastDomain recorded a decidedly-slow average speed of 2.3464 seconds to load our simple single-page test site from 13 locations worldwide, and a better-than-average 1.1102 seconds from 7 U.S. locations (see Speed Test Results screenshot right). It is worth noting that the unusual disparity between the worldwide and U.S. page-load averages is attributable to the fact that all downtime periods recorded during speed testing were reported by two of the ‘worldwide’ test locations (Frankfurt and Amsterdam) not included in U.S. test reporting. Despite the positive qualities of its fully-featured shared hosting plan, performance issues combined with less-than-consumer-friendly practices preclude our endorsement at this time. FastDomain has earned only 3 stars and is not recommended. Better hosting is available for less. Cheap website hosting company price comparisons based on 1-year term list price before coupon/promo codes or limited time/introductory offer discounts. These are the renewal rates for the second year of hosting. To ensure that you receive the most affordable FastDomain Web Hosting pricing possible, please visit our Web Hosting Coupon Codes page for current discounts and special offers before making any purchases. FastDomain Inc. was founded in 2005 and now provides hosting services for thousands of personal and business websites worldwide. The company is headquartered in Utah and offers internet hosting packages for individuals and businesses that provide professional service at a far more reasonable cost than those offered by many other web hosting firms. FastDomain offers a variety of products for its clients, which include not only web hosting, but also domain registration at reasonable prices. The company tailors its web hosting services to suit everyone from the person who wants complete functionality on a tight budget to the business owner who operates an ecommerce site. The company’s ingenuity and commitment to its clients allows it to offer first-class webhosting at an affordable cost. The introductory costs for shared web hosting packages are discounted from the monthly base rate. In addition, FastDomain includes a coupon for domain registration. Hosting plans include unlimited disk space and bandwidth, unlimited MySQL databases, unlimited e-mail addresses and autoresponders, and unlimited parked domains. For customers who desire an upgrade from the Standard Hosting Packages, FastDomain offers a Pro Package. This package provides 80% fewer accounts on a server so that there are more resources available per account, including more bandwidth and disk and CPU usage. Pro Package offers greater speed, more memory, and an increase in power, along with fewer users. The Pro Package saves subscribers more than $200 per year on the cost of purchasing these features as separate upgrades. FastDomain frequently offers special offers and promotions to clients during their initial subscription period. It should be noted that these offers are limited-duration promotional prices available to new clients and are only valid during the initial term, not for subsequent or renewal periods. In addition to providing first-rate web hosting at affordable prices, FastDomain also offers professional customer service. The company has an online help center which makes available a multitude of popular tutorials. It also has toll free 24/7 phone support. The company’s patient and responsive support personnel strive to provide the highest quality support available and are waiting to meet customers’ hosting needs. The firm’s experienced website hosting team can help make customer sites productive because they know what it takes to find online success. FastDomain customers receive the foremost feature set available, extremely functional tools for administering sites, high quality equipment, professional customer assistance, maximum guaranteed uptime, and secure backups. They can count on the company being an honest and reliable business partner. Potential clients can visit the online demo site at FastDomain.com in order to try out the firm’s services and a number of the tools available. This video tutorial will show you exactly how to install WordPress on your FastDomain Web Hosting shared account using the their cPanel control panel and installer.